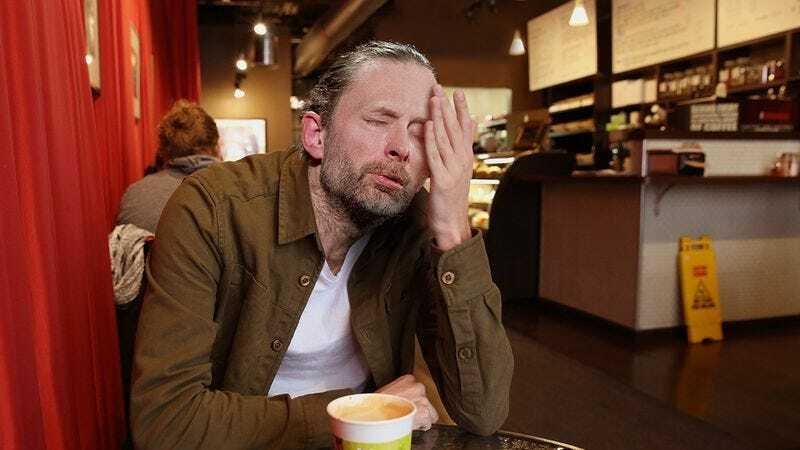 If you’re as big of a fan of Radiohead as we are, you’re going to want to sit down for this: Lead singer Thom Yorke was recently spotted smacking his own head like someone trying to think hard! According to several eyewitnesses, Yorke was sitting in an Oxfordshire, England coffee shop and hitting himself in the head the way someone does when they’re trying to get the wheels in their brain turning, reportedly saying things like “Come on, Thom!” and “Think, Thom, think!” in between smacks. For fans who have been itching for new Radiohead since they released their last album in 2011, it looks like the wait is going to be over soon! This is huge. Rumors about the band’s upcoming ninth studio album have run rampant in recent months, but little is known about the actual content of the record. This recent development, however, pretty much guarantees that it’s going to be amazing. Let’s hope there are even more sightings of Thom smacking his head in the coming weeks! So, yeah. If you weren’t already super pumped for the next album from one of the greatest bands of our lifetime, you definitely are now!